If you use royalty free music to create a YouTube video, then at some point you may receive a “Copyright Notice” from YouTube. These notifications are fairly common. I’m here to put your mind at rest, to explain why these copyright notifications appear, and show you how to resolve them quickly. Why did you receive a copyright notification? Music distributors use automated software (not a real person) to scan the content of YouTube videos to search for naughty people who are using their music without permission. This is called "Content ID Matching". This software listens closely and if it detects that part of your video sounds the same as one of the recordings that this distributor manages, the distributor will initiate a copyright claim. Important: These claims are almost always a mistake. They are what we call a "False Copyright Claim". If you have used our royalty free music in the background of a YouTube video then you have done absolutely nothing wrong. For a full explnation of why False Copyright Claims happen, I highly recommend reading the following article, 'How to Prevent False Copyright Claims'. When a copyright claim has been initiated, YouTube will place a notification in your video manager that says: “Matched third Party Content”. These notifications are quite common. Heck, I even get them on videos that I’ve created with my own royalty free meditation music! Fortunately they are usually resolved quite easily. What happens if you ignore copyright notifications? 1. Advertisements may be run over the video to monetize the content and compensate the third party for the use of their content. 2. Your own ads may be paused, causing you to lose revenue. 3. Your video may be blocked or even removed entirely. I think you'll agree that it's in your interest to address these notifications promptly. There are two steps to this process. You can usually dismiss these notices from your YouTube account with just a few mouse clicks. Below is an example of a YouTube copyright notice that was sent to me by a customer who used our royalty free music in one of her videos. Notice the link at the bottom to “file a dispute”. Follow the link to dispute the claim. You will then be presented with a number of response options. One of those options will be: "I have a license or written permission from the proper rights holder to use the material." Select this option and then select "Continue". On the next screen you will be asked for additional details or an explanation (a reason for your dispute). I recommend that you enter the following information at this point: "A license to use this music was purchased from www.enlightenedaudio.com. Using this music within YouTube videos is permitted by the license terms which you can view here: www.enlightenedaudio.com/music-license. IMPORTANT! Please remove the claimant's sound recording from your Content ID database. This sound recording uses ROYALTY FREE BACKGROUND MUSIC therefore IT SHOULD NOT BE SUBJECT TO CONTENT ID MATCHING AND YOUTUBE COPYRIGHT CLAIMS. Unless you remove this sound recording from your content ID matching service, it will continue to trigger false copyright claims. Finally, submit / confirm your dispute. This should result in the copyright claim being removed within 1 - 14 days. Step 2 is optional, but I HIGHLY recommend it as you will greatly improve your chances of having the copyright claim removed, and you will also reduce the chance of the copyright notification being reinstated again at a later time. I have received a copyright notification on one of my YouTube videos [include a link to your video here] which claims I have infringed on the copyright of your sound recording [insert the title of the claimant's recording here]. This claim is incorrect. You have used the same royalty free background music in your recording as I have used in my video, resulting in a false Content ID Match. Because your recording uses royalty free music, it is essential that you contact your distributor (CD Baby) and ask them to (a) remove this copyright claim on my YouTube vide, (b) disable Content ID Matching for your recording, and (c) remove your recording from any sync licensing arrangement. For more information about this, please read the following article: https://enlightenedaudio.com/how-prevent-false-copyright-claims. 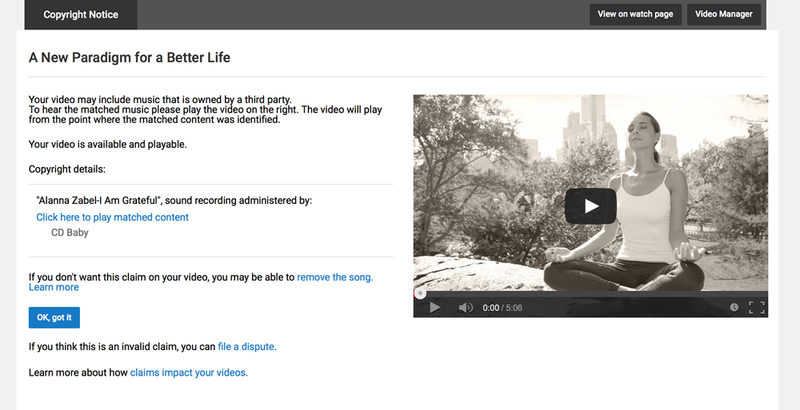 Unless you respond to this matter, your recording will continue to trigger false copyright claims on YouTube videos. [Your name and contact details]"
In almost all cases, YouTube will withdraw the copyright claim within 14 days with no further action required on your part. However, sometimes you may find that your dispute is rejected and that the copyright claim is reinstated. If this ever happens to you, be sure to file a dispute again. The claim wil eventually be dropped. These notifications can be a bit of an irritant, but try to keep a positive, proactive attitude towards them. As I mentioned earlier, you DO have the right to use our music to create YouTube videos and no automated copyright claim can change that.